Autumn is pretty much my favourite time of year. The air has a certain soft mellow feel that I love, and when the evening chill sets in I'm lighting an open fire but it's not so cold that I'm swearing and cursing while outside cutting the kindling to get the fire going. 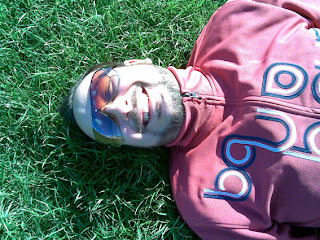 It was still warm enough last week to go and lay around on the grass at Waitangi Park. This park has become our walking place - where we go when we are feeling a bit cooped up in the office. A quick jaunt around the park, or a quiet meander, depending on the mood. Mostly the latter really. For me anyway. Meandering is a good thing. Anyway, here's my office buddy laying around on the grass. Is that grass really green, or what? check out those mountains. The grass looks so nice and cool. fall grass is better than spring grass. Autumn is the best season. We're quickly approaching summer and that is the most dreaded. Eating ice cream and swimming are the only thinngs going for summer. Mountains? That's just Wellington hills! Our city is built on them. Apparently we're a bit like San Francisco in the respect, but that's just hearsay. I've not had the joys of travel as yet. 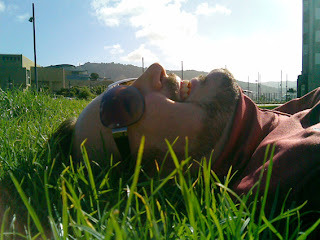 I think Wellington is a lot like San Francisco...only with more varied, interesting weather, and less spoiled that America in general. Geographically though, it does feel similar. Since you're a graphic designer in Welly, maybe you know Dean Proudfoot over at Watermark design? I visited that creative collective when I was there...very cool stuff. Thank you for the compliment! Yes, I was in Wellington serving coffee in 2005. I worked for a short time at Felix...where I discovered a whole treasure of NZ coffee-related slang (flat whites, yo-yo's...which I gathered is a cookie). Previously I had worked in coffee shops in Philly, but it was very serious business in Wellington!! I stopped trying to brush my hair while in Wellington...it just blew all over and became a knotty mess again. I did enjoy it all. That Watermark is a very cool concept. As you know, working from home can be very difficult when you're the only one around to keep yourself going, but there I imagine the creativity and ideas probably multiply like mad.